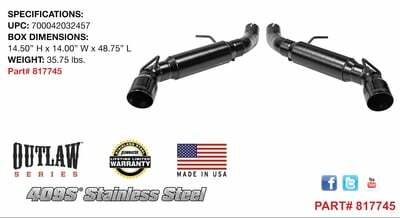 Flowmaster's Outlaw Axle-back exhaust system for the 2016 Chevrolet Camaro SS coupe and convertible. Very Aggressive tone. Easy bolt-on emissions-legal system for the 6.2L V8 features a pair of 409S stainless steel Outlaw Series mufflers with 3in stainless steel mandrel bent pipes. The system finishes off with 4in polished black PVD coated stainless steel tips. Benefits include improved throttle response, power and mileage. Includes all necessary parts and hardware for installation. Note: Automatic transmission models include active exhaust valves that operate while in MDS mode. These valves are retained with this system. This system does not fit models with the Performance Exhaust Option.